Video clip synopsis – Writer and political activist Oodgeroo Noonuccal’s poetry represents and captures the growing reaction by a new generation of indigenous Australians against the long-standing colonial mentality. Broadband MP4 oodgeroo_bb.mp4 (10.4MB), suitable for iPods and computer downloads. Oodgeroo Noonuccal is a video clip from the documentary series and website First Australians produced in 2008 by Blackfella Films for SBS Television. First Australians chronicles the birth of contemporary Australia as never told before, from the perspective of its first people. First Australians explores what unfolds when the oldest living culture in the world is overrun by the world’s greatest empire. discuss and reflect upon the historical, political and contemporary importance and influence of activist, critic and author-poet, Oodgeroo Noonuccal, both on the indigenous Australian community and the wider Australian public. research, plan and construct a media display of selective information within both narrow and broad contexts (the little picture and the big picture). work collaboratively to analyse, interpret and explain a work of literature in terms of its historical importance. discuss, assess and construct a presentation about the historical relevance of a major indigenous Australian political organisation, aimed at a specific audience, using computer tools and technology. This video clip on writer and political activist Oodgeroo Noonuccal demonstrates an almost inevitable cause and effect relationship linking Australian prehistory, the time before written language was used to record information, to the recent past, the present and the future. The video clips from the series and website First Australians titled The Songlines, The Rainbow Serpent, European Observers and Trade Routes provide us with a view of Australian indigenous culture and history to 1788. This culture and history was placed severely under threat as European dominance spread through the land from 1788 onwards. 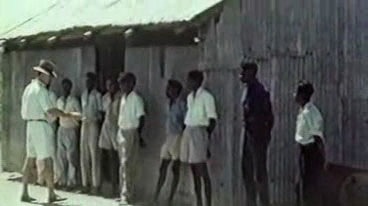 Indigenous societies were eventually placed into government-controlled settlements -archival film of these is shown in the Oodgeroo Noonuccal video clip where the inhabitants were denied citizenship and the rights of free movement around the country. Noonuccal’s political activism, expressed through her poetry, represents and captures the growing reaction by a new generation of indigenous Australians against this long-standing colonial mentality. It helped to play a part in the general consciousness-raising of the wider Australian community, which led to the 1967 referendum on Aboriginal citizenship, and later landmark legal decisions such as the Mabo land ownership decision in 1992, and the Stolen Generations report of 1997. As we see from her poetry in the clip, there is an unbroken link between the ancient past and the contemporary present, via the arrival and settlement of European civilisation over a 200-year period, which illustrates the long journey that Australian indigenous peoples have travelled. To what national organisation was Oodgeroo Noonuccal elected in 1962, and which Australian state did she represent? When did she publish her first book of poetry? Explain the critics’ response to the book. In general what was the poetry about? Why did Noonuccal refuse to accept an MBE award in 1988? What does her name mean? What was her English name before she changed it? Why do you think she changed her name? What were her birth and death years? Construct a selective timeline on large display paper of Noonuccal’s biography, ensuring you place it into a wider perspective by including references to significant aspects of Aboriginal struggle for national and state rights and advancements over the same time span. Noonuccal’s poem, Charter of Rights, is quoted in the video clip. Write the poem out, then in pairs carry out further research and write a discussion in 400–500 words elaborating on the historical and political issues in Australia surrounding both the issues in the poem and the circumstances in which it was written. Carry out appropriate research then prepare and construct a one or two-page display for a popular history magazine on the history, importance and significance today of the Federal Council for the Advancement of Aboriginal and Torres Strait Islanders (FCAATSI). Ensure you include details about the main members and participants in the organisation, and the work they carried out. Use desktop publishing for layout and presentation, with illustrations and photographs where relevant.